Joanna has been working on this wedding shawl, for our daughter Celia, since early fall. It’s been tough going, one-step-forward-two-steps-back at times. The end is in sight however and she has promised to work on it an hour each day until it is done. I don’t know how she does it, but I’m the sort who has difficulty sorting out his shoe laces. I asked how many stitches she thinks she will have completed in the end … she didn’t know, so we figured it out … ready for this … more than 85,000! See our post on Patience and perseverance. 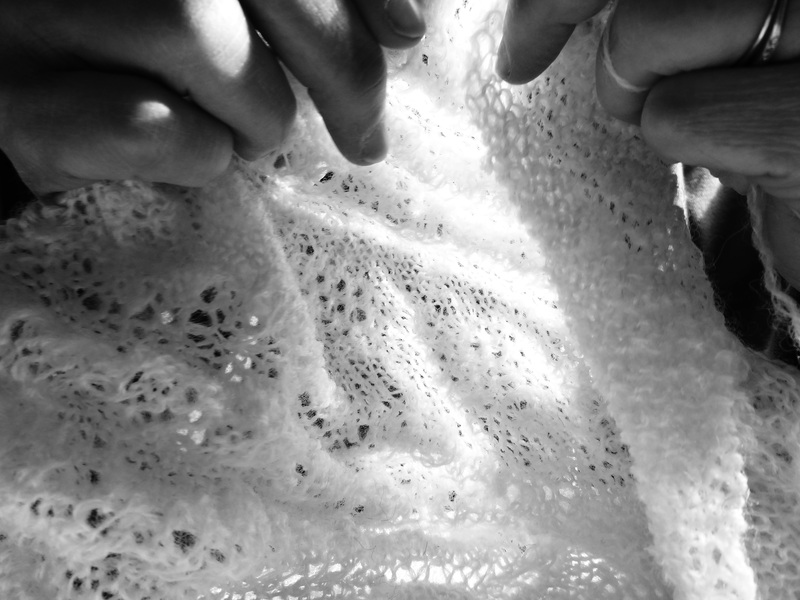 The instructions indicate that the project (Simply Elegant Stole from Fiddlesticks Knitting) is based on traditional Estonian lace patterns. It is made from nearly ¾ of a mile of 2-ply, lace weight, hand-spun yarn made from the fleece of a three-year old Shetland ewe by the name of Marianne. I will post an image of the completed project when it is done; stay tuned.